I think we can all agree that LA's Allah-Las are making some of the very best, Sunshine State psych that you're likely to come across. It's no doubt the kind of noise that will make for a heck of a good time live and up close. If you've got a hankering to see the lads tear things up here, yours truly can help. 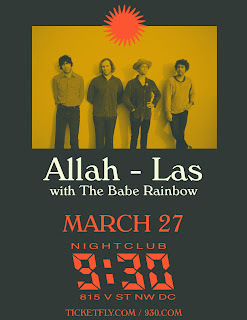 I have a pair of tickets to their 3/27 show at the 9:30 that very well could have your name on them. To win this pair of tickets, just send me an email telling me why you'd like to win said pair of tickets. Be as verbose or as concise as you wish. Just make it good! Fine print: Contest is for two (2) tickets to this show. Contest closes at noon Eastern on Saturday, 3/25/17. Good luck, dudes and dudettes!